I recently received another box of tea chocolates from Matcha Chocolat, this time the Jade Collection. The selections available vary according to season, starting with the Emperor’s Selection available from March to May, this one from June to August and the Lotus Selection, September to November. I hope the yawning gap between Christmas and Easter will be filled in due course. I like these chocolates. I got another chance to practice delayed gratification, as their arrival coincided with flat camera batteries AGAIN. As the batteries were charging, I consoled myself by taking the lid off the very attractive box and feasting my eyes and nose with the wonderful aromas and the exquisite presentation. Liquid Jade – Presented as an attractive white chocolate dome with swirls of green running through, this contained a rich dark chocolate ganache that contrasted well with the sweet white chocolate casing. If you’ve tried matcha tea, you will recognise the taste immediately. It has a robust character, leaving a slightly bitter taste lingering on the tongue – a refreshing sensation. There is also an almost savoury umami quality about it. This was a strong contender for best in the box for me. Strawberry Summer – Fruity dark chocolate with a delicate strawberry flavour. The subtle tea and dark chocolate notes followed through soon after. Its smooth ganache made an interesting in the mouth contrast to the hard chocolate casing. Although, the chocolate was dark, CT thought it had quite a creamy texture. China Rose – As a big fan of rose flavoured anything, but especially rose chocolate, I was delighted to see these in the box. I got a fragrant waft of rose as soon as I picked this one up. The rose became even stronger as I bit into the beautiful shiny dome of milk chocolate. What I got was a wonderful mouthful of smooth rose ganache which melted slowly on the tongue with a definite rose flavour. As the ganache and chocolate melted in my mouth, the more subtle flavour of the black Gong Fu tea came through. I loved the blend of flavours in this one and would have been more than happy to have an entire box of them. My mind was suddenly filled with images of Edwardian ladies in large hats sitting down to tea on the lawn with the summery air scented with roses. CT thinks these should be a catagory C drug as they are almost certainly addictive. He reckoned it would be easy to gorge on a dozen of them and then feel sick, but content. This one did get my best in the box vote. Sencha – This was the one I found hardest to bite into because of the wonderful gold design on the top of these square white chocolates. When bitten into, it was a delightful surprise to discover that the ganache was green. Sadly, the look of this one was the best part for me. It smelt and tasted very strongly of green tea – not green tea that is fragrant and lightly brewed, but tea that has been left in the pot too long. The bitter taste lasted a long time after all physical traces had long been swallowed. CT, on the other hand really liked this one as it reminded him of sitting in a kaiten sushi bar in Tsukuba, Japan eating far too much and drinking copious amounts of green tea. Masala Chai – This was as good as I had remembered it from the Emperor’s Selection and I was very pleased to experience the wonderful spicy flavour of chai once again. The cardamom in particular came through in the ganache and the slice of crystallised ginger complements the whole very well. This would make an excellent gift both for chocolate connoisseurs and tea lovers alike. Even if you don’t like tea but have an open and enquiring mind I’m sure you will enjoy this new world of flavours. We would certainly not be averse to trying another box or ten. I am drooling AND writing…masala chai choclate! rose chocolate! hmmm! I will take a dozen of each please! Wow, each one of these sound amazing. Oh you lucky, lucky things. I am very jealous. I was inspired by your original post on these choccies to get in touch with the maker to get a present for a relative, unfortunately I didn’t allow enough time, as is all made to order. So if anyone is tempted do bear that in mind. Ok they really do inspire me to keep on plugging away at getting the tempering right. They look exquisite! They’re mini works of art! yum scrum, and aren’t you a lucky one?! They make my Thornton’s continentals look so cheap. Aren’t they just so beautiful. Boy, these look good! I’ve only properly discovered matcha on my trip to Japan and am loving it now. It’s an acquired taste, but hell, it’s so good! So beautiful! I’d like to try first one! Thank you all for your comments – as you know I do really appreciate getting them. Joanna – sorry you were disappointed in not being able to get these on time. I have been told that they will try to get orders posted out the day after receiving them. Ooh, I want these chocolates! I was so disappointed when I clicked over to the Matcha website and found out that they don’t ship to the US. Sigh. 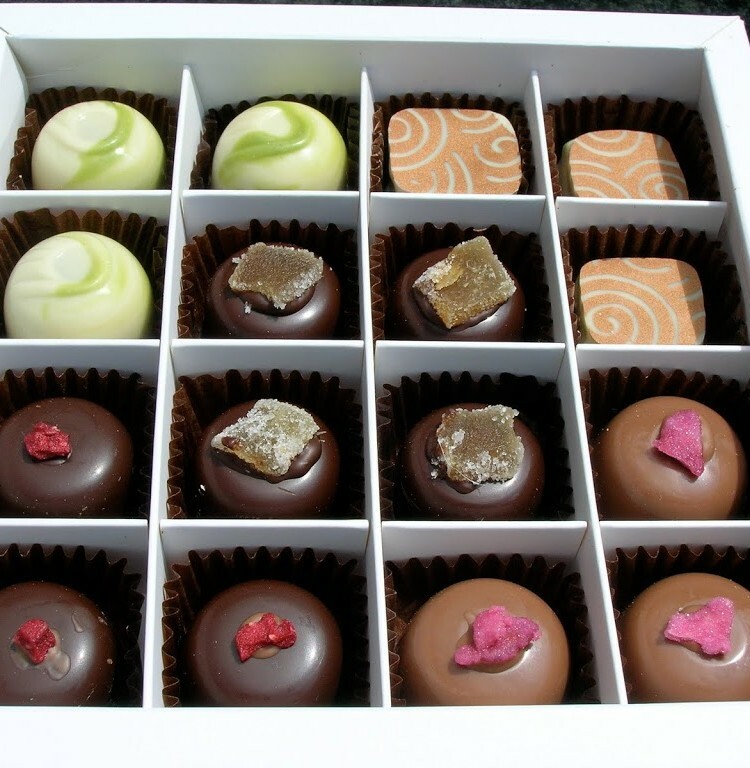 oh my..such beautiful and heavenly delicious looking chocolates…looks very cute..
Rowdy – maybe use it as an excuse to make a trip to the UK!!! Suman – they are particularly good chocolates and very attractive too. I need some of these I am drolling at all the reviews I ahve read so far. Bummer I’m in the U.S. as well and would have LOVED to try these Chocolates. Talk about heaven! Your pictures are great too!